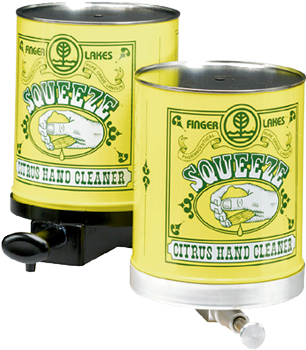 Finger Lakes Squeeze™ is the most advanced waterless hand cleaner ever made. 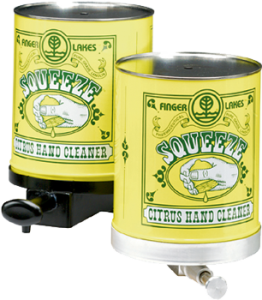 Formulated from natural citrus fruit, this environmentally safe hand cleaner removes ink, grease, tar oil, and paint. It is free of harsh solvents and is available with or without pumice. Both formulas contain pharmaceutical-grade anhydrous lanolin to prevent chapping of skin. 1. Can be used with or without water. 2. Apply a small amount to hands. 4. Rinse and/or wipe hands.